In 1646, as England was plunging into a bloody civil war, a physician from Norwich published the first edition of Pseudodoxia Epidemica , a seven-volume treatise whose title could be loosely translated as "epidemic of incorrect belief" or simply "vulgar errors." Several editions followed during the Commonwealth and Restoration. The author was Sir Thomas Browne, and Pseudodoxia Epidemica , along with some of his other works, nudged England a little closer to modernity. Browne was born in 1605, the son of a silk merchant. He didn't hail from a family of knights, but acquired his knighthood largely as a matter of luck; Charles II bumped into him while on a quest to hand out honors. Knightly or not, Browne was bright. He got a scholarship to Winchester College at the age of 11 and stayed there until he was 18. He entered Broadgates Hall (later Pembroke College) in 1623. He followed up matriculation at Oxford with study abroad at some of Europe's best universities: Padua, Montpellier and Leiden, where he obtained his doctoral degree. English recognition of his medical degree took some time, and while he waited, Browne settled in Shibden Dale in Yorkshire. He later set up a medical practice in Norwich, a bustling city that had grown up around the wool industry and, in Browne's day, hosted printers publishing books in Dutch as well as English, along with the requisite butchers, bakers, goldsmiths and moneylenders. Browne's home was in the middle of the action, near Market Square. Around the time that he was the right age to find himself a wife, Browne's writing indicated a lack of enthusiasm. Regarding the belief that a woman was to be a man's helpmeet, he remarked that a woman's only use was "unto generation; for as for any other help, it had been fitter to have made another man." 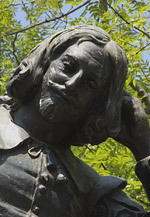 In his book In Search of Sir Thomas Browne Hugh Aldersey-Williams acknowledges Browne's paltry praise of women but also argues that Browne was happy to acknowledge the contributions of female scholars. And Browne did find a wife who worked out well "unto generation." He and his wife Dorothy had 11 children. But making babies was one thing; seeing them grow up was much rarer in the 17th century. Babies were so prone to death in their first year of life that the physician Browne was reluctant to "count any alive" — his own children or anybody else's. Six of the Browne children died before their parents. Although the surviving Browne son, Edward, became a member of the Royal Society, president of the College of Physicians, even physician to Charles II, Edward's children faced as tough a world as his siblings had; within three decades of Sir Thomas Browne's death in 1682, the Browne line was extinguished. Though his descendants didn't long outlive him, Browne's writing did. Besides Pseudodoxia Epidemica , he left Religio Medici (a kind of note to himself in spiritual matters), The Garden of Cyrus (ruminations on numbers and patterns in nature), Urn Burial and Natural History of Norfolk (describing local wildlife). He focused on the uses plants and animals had in medicine, and he counted among the first naturalists to point out that some local species were in fact migratory. But Browne's masterwork was arguably Pseudodoxia Epidemica . According to Aldersey-Williams, Browne coined 784 new words, most of them in Pseudodoxia Epidemica , including anomalous, antediluvian, ascetic, botanist, circumstantially, considerably, deductive, electricity, fallaciously, hallucination, horizontally and vertically, improbably, incontrovertible, insecurity, invariably, medical, prairie, precarious, presumably, and traditionally. Browne applied logic and experimentation to a wide range of subjects: whether flies buzzed with their mouths or wings, whether elephants could bend their legs, whether Jews smelled worse than Christians. He rejected the last claim, but not outright, only after giving the subject much thought. He also rejected the belief that black skin resulted from a divine curse. Browne's attempt to stamp out what he saw as the pseudoscience of his day didn't go unchallenged; Scottish writer Alexander Ross answered Browne's books with Medicus Medicatus ("A Doctor Doctored") and Arcana Microcosmi , defending some of the traditional notions Browne sought to overturn. The existence of the phoenix, the mythical bird that lives for centuries and rises from the ashes of its own funeral pyre, was one of the topics Browne and Ross hotly debated, Browne arguing it was an old myth. They even argued over whether the bird would have been admitted onto Noah's Ark. In The Phoenix Joseph Nigg recounts how Browne argued that ancient authors had written about the bird "poetically," "enigmatically," "rhetorically," "emblematically" and "heiroglyphically," an argument Ross simply didn't answer. In Sea Monsters , Nigg highlights another myth Browne rejected: that land animals had marine counterparts and vice versa. That all Animals of the Land, are in their kinde in the Sea, although received as a principle, is a tenent very questionable, and will admit of restraint. For some in the Sea are not to be matcht by any enquiry at Land, and hold those shapes which terrestrious formes approach not . . . and some there are in the Land which were never maintained to be in the Sea, as Panthers, Hyaenas, Camels, Sheep, Molls, and others, which carry no name in Ichthyology, nor are to be found in the exact descriptions of Rondeletius, Gesner, or Aldrovandus. He once remarked upon the existence of unicorns in nature, but he didn't necessarily mean the horse-like animal with a horn projecting out of its head. Instead he was referring to single-horned animals, and alicorns — reputed to be unicorn horns, in actuality narwhal teeth — were traded throughout Europe, far removed from their animal owners. He didn't believe in the griffin, sphinx or chimera because he didn't think their parts could fit together into a single animal. But he believed in basilisks, satyrs and Pegasus, maintaining that their "shadowed moralities requite their substantial falsities." In other words, he'd allow a few fantastic creatures if they advanced a good story or even better, a good moral of a story. Like many physicians of his time, he applied astrology in his medical practice. Aldersey-Williams explains that, as foolish as that sounds today, the alternative at the time was to blame the patient's sins for his or her illness. Blaming the stars and planets at least took a little of the shame away. And Browne believed in witches. He offered "expert testimony" on the dangers of bewitchment in more than one trial. So although he did his best to save lives as a physician, he played a part in sending multiple accused women to their deaths. As he urged his contemporaries into the Enlightenment, he kept part of his thinking firmly in the past. 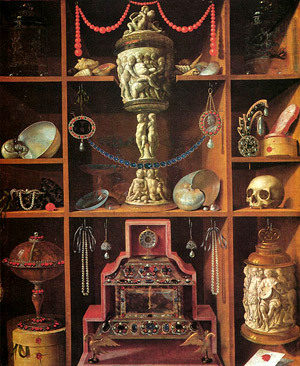 Besides a physician and author, Browne was a collector. He owned a sizable book collection and kept his own curiosity cabinet. 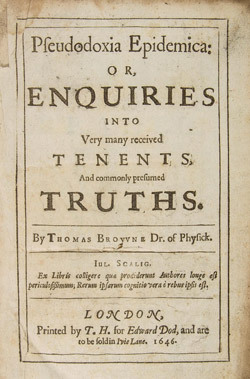 Its contents were lost long ago, but to refute satirists such as Thomas Shadwell — whose play The Virtuoso mocked 17th-century savants indulging in "pointless" investigations of atmospheric pressure, microscopic life, bioluminescence, or the stars and planets — Browne penned another book, Musaeum Clausum . It poked a little fun at collections, too, but made the point that all that collecting, measuring and pondering could lead to better understanding.